Summary: Following the confusing events in New York, Power Girl decides to look for Superman in Metropolis to talk to him about her power fluctuation problem. 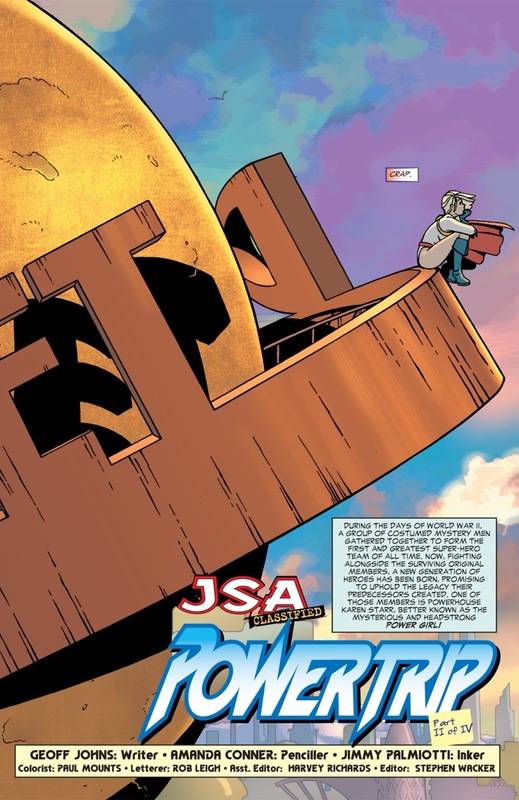 She doesn't find him at the Daily Planet but is met by Jimmy Olsen who decides to have lunch with her on the roof of the Planet building. They converse for a bit before Power Girl catches sight of an aeroplane crashing into Metropolis. She takes off to stop the plane from crashing but is prevented from doing so with the arrival of the Legion of Superheroes. The Legion of Superheroes capture Power Girl and tell her that she belongs with them and that they have been looking for her. They tell her that she is Laurel Gand from the planet Daxam and that she is their Andromeda. Kara is sceptical of their story, but is far more concerned about the crashing plane and the passengers inside the plan. Each time that she tries to save the plane, she is blocked or prevented from doing so by the Legion, which upsets her. Eventually Superman and Supergirl show up to help the plane land safely, which makes Power Girl feel like a failure. Superman decides to have a private talk with Power Girl by asking his own cousin to give them some privacy. Superman expresses concern for Power Girl's well being, especially after the passengers described Power Girl constantly "holding herself back" in her rescue attempt. Power Girl tries to tell Superman about the Legion of Superheroes restraining her from the rescue, but Superman says there was no one present to stop her, according to the witnesses. She then tries to get Jimmy Olsen to testify for her since he was her only witness to know what actually transpired, but she doesn't find him and Superman tells her that Jimmy has been with his wife, Lois Lane, the whole time. Superman and Power Girl do have a brief talk about what's been happening to her powers and tells him that she is afraid to learn the truth about her origins because she might not like what she learns. Superman validates her concerns to tell her that it's perfectly okay for her to feel that way. Power Girl departs feeling slightly better, but still doesn't know what's happening to her. At the end of the issue, both the Legion of Heroes and Jimmy Olsen that encountered Power Girl earlier are revealed to be hallucinations created by Psycho-Pirate to drive her mad in order to achieve his own goal. Review: Geoff Johns' exploration of Power Girl's true origin continues in this issue, this time by tackling an origin story for a character that was originally created to replace the pre-Crisis Earth-1 Supergirl, Andromeda. It was actually a clever way of continuing to hint at Power Girl's true origin as the cousin of Superman given that Laurel Gand is another Daxamite who is descended from Kryptonian colonists. It also further hints at Power Girl's status as a survivor from a different reality, seeing that Laurel Gand is also--in a sense--"out of this world" as a 30th century superhero. However, more than the question of Power Girl's origins are the heart and centre of this story, Johns spends more time exploring who Power Girl is and how she feels about herself. The way Johns explores Power Girl's feelings about herself in this issue is both insightful and heartbreaking at the same time. It's insightful because it shows us who Power Girl is at her core. Despite a bold, confident, and tough exterior, on the inside Power Girl is actually very kind and she does care about other people. She does value the lives of others more than her own, and that's something that comes through in the scene where she tries to stop the aeroplane from crashing. But there's also a strong part of her that feels that she doesn't belong on this world, and that there is something very off about her place in it. She can't put her finger on it, but she nonetheless feels like an imposter, and that's the part of the story that makes this so heartbreaking. I don't think I can ever complain about Geoff Johns' characterisations of DC characters when he's actually in control of the stories he is telling, meaning no editorial mandates or interferences. This story also shows that he is a very versatile writer. He may excel at writing epic Justice League and Justice Society stories, complete with triumphant battle sequences, but when he gets down to the characters themselves, his stories can be profoundly character driven. Power Girl's story in this particular series very much fits that premise and Johns doesn't apologise for it. He doesn't even apologise for depicting Power Girl as a character who does have emotions. That is what actually gets you--the reader--to connect with her character on a more meaningful level. 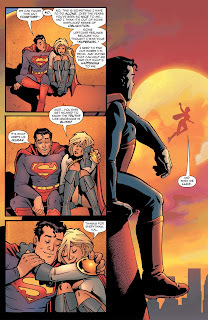 The scene in the issue that best showcased Power Girl's feelings about herself was in the scene she shared with the post-Crisis Superman, which was both serendipitous and cathartic for the character. 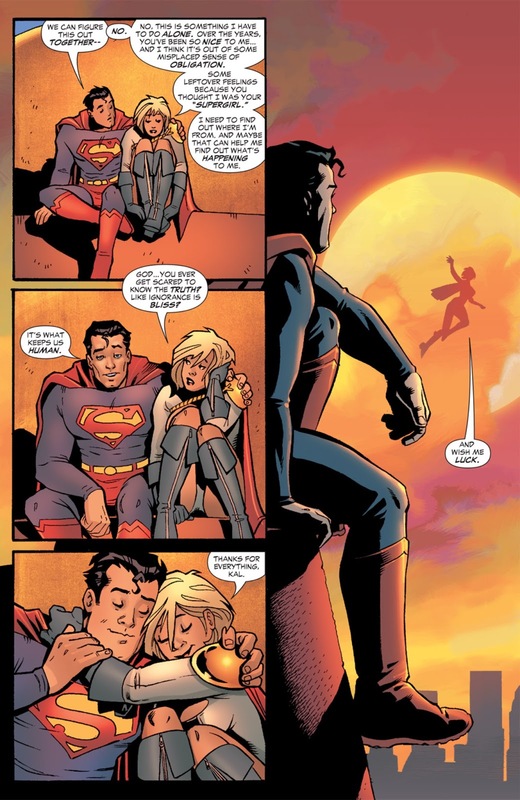 It was also a scene that called back to Power Girl's own relationship with the original Golden Age Superman who was her cousin on Earth-2, and the kinds of conversations she would have with him. The post-Crisis Superman kind of functions as a surrogate for her own cousin in this scene, but in a way that makes her sadder. Like deep down she knows that she is still connected to him somehow. On that note, Johns also revisits the question about her cleavage window and why she has it. Admittedly, I didn't feel the explanation he provided actually honoured the real reason Power Girl avoided wearing a symbol as established in All-Star Comics #64 in 1977. The original reason established by Paul Levitz in 1977 was that Power Girl wanted to stand out as a hero of her own standing and not as a "carbon copy" of her cousin. She wanted people to think of her as a separate person from her cousin, not as an extension of him. In having Power Girl tell Superman that she's always wanted a symbol of her own but didn't know what to use to "fill the hole" in her chest, I feel like he actually weakened the feminist message of her original decision. I honestly felt the original idea of her not wanting to be seen as an extension of her cousin was a pretty valid reason for her not wanting a symbol. It wasn't the symbol that mattered to her as much as the person she wanted to be, and that was actually powerful. Changing that original idea ended up taking that power away from her. At best, I think Johns was trying to justify the window's existence and move it away from the male gaze and the running gags that objectified her, but I think preserving the original reason for her fashion choices would've been sufficient justification. Power Girl was created in an era of second wave feminism, and much of the character's initial development embodied the values of the women's liberation movement of the 1970s. That included wanting people to treat her with respect and to value her thoughts, choices, and opinions without shaming her for them. Despite originally being created in a way that objectified her, Power Girl's original costume actually embodied those very ideas, even if by accident. This was something that was also addressed in the 1990s when Power Girl openly stated that she chose a costume that embodied her comfort with her own body and that she was never going to apologise for that. If other people had a problem with that, that was on them. She was never going to change for the comfort of others. That's really all the justification Johns needed for the cleavage window. He didn't need to do anything else with it. On the whole, this continues to be a strong issue. And of course, Johns could not have fully accomplished that without the artwork of Amanda Conner, who once again packs the emotional punch. 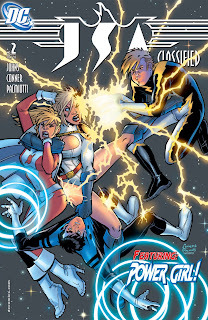 Conner demonstrates such a strong understanding of Power Girl's character through her use of body language and facial expression, her artwork is successful in engaging the reader right away. The feel for Power Girl's character is further augmented by Jimmy Palmiotti's inks and the colours by Paul Mounts. 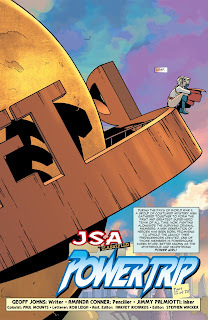 Next week, we continue Power Girl's journey with JSA: Classified #3!